We’ve just had three important holidays and celebrations pass us by, and all of our teaching of vocabulary, concepts and the crafts to go with them. It is always delightful to be talking about our family traditions, making fun projects and reading lots of stories. We integrate as much of the Kindergarten knowledge, skills, strategies and processes to be taught into these activities where we can. But we never forget our Language and Literacy foundations of phonological awareness, listening and speaking and beginning printing. So this week, we found ourselves already up to the letter H in our Alphabet! Clearly, the weeks are flying by. 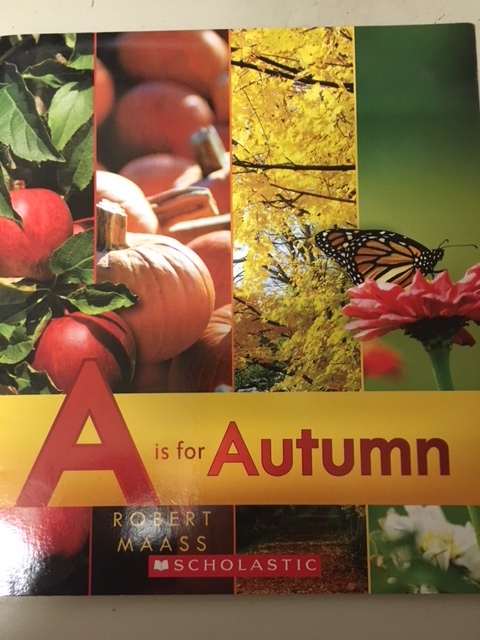 The children listened to the stunning A is for Autumn, by Robert Maass for alphabet inspiration. The photography is absolutely beautifully, with simple alphabet rhymes about the fall. We completed our Itchy’s Alphabet page, made heartfelt h’s and the printing in our Alphabet books…amazing! Just look at these straight lines perfectly formed. In this short time between Remembrance Day and our kick-off to Christmas (Christy and I are counting down the days), we are teaching a mini-unit on Bears in Literature. The focus of our unit is on story structure: beginning, middle and end. This is the vocabulary we are teaching the children, and words you can also use at home when talking with your children following their bedtime story. 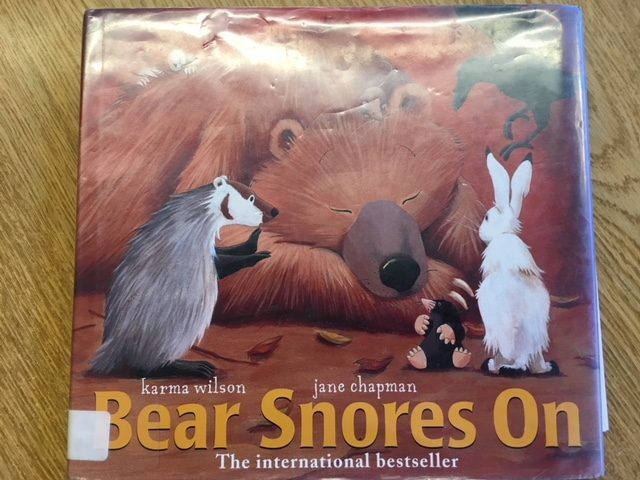 For the first story our UBC student Teacher Candidates (TCs) taught Bear Snores On, by Karma Wilson and Jane Chapman. Bear has started his hibernation and is sleeping when his animal friends come by and have a party. He is very disappointed at waking up and missing all of the fun! The children had to pay close attention as they participated by choral chanting “and the Bear snored on!” every few pages. They learned some unfamiliar animals, such as the badger and the wren, and reviewed what happened. In their follow-up lesson next week, the children will colour, cut and sequence pictures of the beginning, middle and end of the story. Karma Wilson and Jane Chapman have written an entire series of wonderful books about Bear and his friends. These are stories worth looking for at your local library. Our UBC TCs are also teaching the final lessons in the “Personal Identity” portion of Kindergarten Studies. Poor Wemberly, from Wemberly Worried by Kevin Henkes, is worried about starting school. Her parents and teacher encourage her along but she is still worried. Until she meets a friend…and then the whole world (and school day) is a lot brighter. 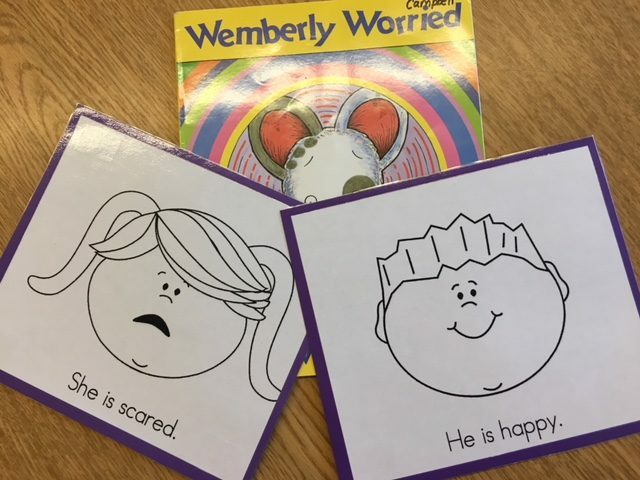 The children talked about their own worries, and reviewed the four main feeling groups of happy, sad, angry and scared. Next week, they will create a graph about their feelings for the day and discuss their findings. In Math we’ve been reviewing our Math rotations routine using new Math Centres such as treasure boxes, sorting bears, geometric flats and connectors. We’ve doing a lot of sorting and classifying of objects, and going over the patterns we’ve learned this term, AB, AAB and ABC. It’s really exciting to watch the children create, copy and extend patterns – especially when they catch an error they made and self-correct. Now that is learning! And we are so privileged (and just a bit thrilled) to be able to observe their thought processes. Wednesday, November 21 has been scheduled by Mrs. Kennedy for our Library Book Exchange for both classes, just before lunch. Please return your books on time. The Grade 4 students are holding a Sock Drive for those in need. We are looking to collect brand new pairs of socks in children’s sizes. Your child will write his or her name on a paper sock to hang in our front hall to note the donation. We’re our annual Christmas Cracker Event on Friday, November 30. We will be making Christmas Crackers with our Big Buddies using the candies you all donated from Hallowe’en. A few supplies we could use are rolls of Christmas wrapping paper, curling ribbon and clean, tissue-free, paper rolls. If you have anything you might be able to donate to us, we’d really appreciate it!